The shopping habits of women compared to men in virtual worlds may reflect those stereotypically seen in the real world. I'm not being sexist here: Ask 100 women if they like to shop or not and I bet you'd get a lot of positive responses. At the least, I don't think it's crazy to say that women like to generally shop more than men. According to a new survey, the same might be true in the worlds of virtual online games. VGMarket surveyed 2221 people and found that "North American women 25 and older are spending 'disproportionately' higher amounts of cash on virtual items and currency." The survey was conducted with users of virtual currency services such as Facebook's Spare Change. Sadly, only 22% of the survey's respondents were female, but it still concluded that women spend "$15 more per year on first-party purchases in social games than men, and twice as much on in-game money." 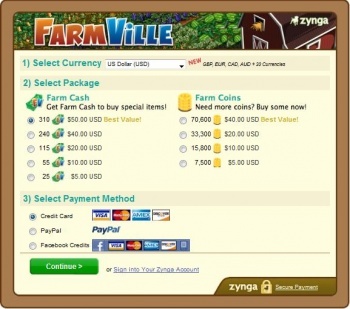 Surveys are always hard to judge, but this one seems to indicate that female gamers have taken a liking to certain virtual worlds such as FarmVille, and that for some reason may be more likely to spend money within them. Do women just like clicking on cows more than men?